I started using Bootstrap a while back, and really enjoy the fact that I quickly can build a website/application using the framework. But there is always room for improvement. I found some useful tools that will help you, if you are using Bootstrap, to build your pages even quicker. The first resource is Divshot, a online tool/interface builder where you can design your pages, then get the HTML code and insert it into your page. I just started using it this weekend, but it is a brilliant tool, easy to use and very helpful. It’s currently in free beta, you just need to register. Update: DivShot is now a commercial product, but you can use it for free if you just have one single project. prettyCheckable replaces the standard checkboxes with nicer looking ones. 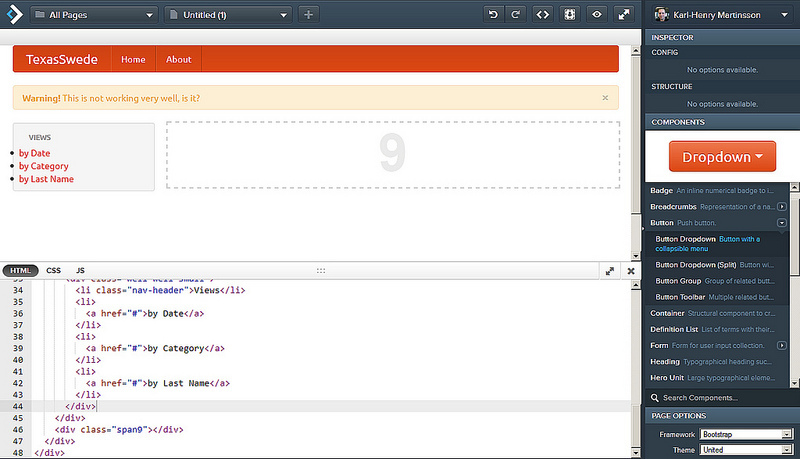 Datepicker for Bootstrap is (as the name indicates) a datepicker, made to match the Bootstrap look. jQuery Form Validation is using the Bootstrap stylesshet to make it match the rest of the framework. I haven’t tried this one yet, but it looks very useful. Fuel UX is another way to extend Bootstrap with additional controls. Very nice looking! Lavish is a cool online tool that takes an image and creates a color scheme based on it for use in Bootstrap. You can find these tools and more here.